With an all star cast consisting of Chevy Chase, Rodney Dangerfield, Ted Knight, Michael O’Keefe, and Bill Murray, Caddyshack will go down as one of the funniest sports movies of all time. Directed by Harold Ramis, Caddyshack did for golf what National Lampoon’s Animal House did for fraternities and Police Academy did for law enforcement. If you haven’t seen it, you’re really missing out. Caddyshack takes place at the fictional Bushwood Country Club. The main story line follows caddy Danny Noonan in his effort to save money for college and attempt to win the caddy scholarship. But there are truck loads of side stories to follow as well. One in particular deals with the groundskeeper named Carl Spackler played by Bill Murray. Carl Spackler is on a one man mission to stop a gopher infestation that has riddled Bushwood Country Club. In his many tries, he almost starts World War III. I’ve always thought it was cool when fictional organizations from the movies get their own merchandise. It makes it feel almost as if its real. Caddyshack has it’s share of merchandise, including a whole line of Bushwood Country Club stuff. This pin/button isn’t rare and only costs $5.00. 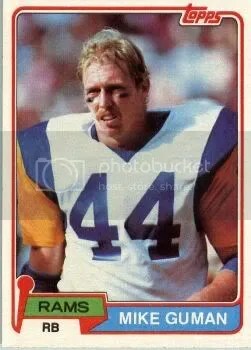 This afternoon I had lunch with former Penn State running back, and LA Rams fullback Mike Guman. Guman was the guest speaker at this week’s meeting of the Selinsgrove Rotary Club, which was held at the Susquehanna Valley Country Club. Mike Guman is most notably remembered for playing in the 1979 Sugar Bowl. Penn State was playing Alabama. You had two of the greatest football coaches in history going against each other – Joe Paterno and Bear Bryant. Alabama was winning 14-7, and Penn State just needed to get over the goal line to score. On Penn State’s last attempt Paterno decided to give the ball to Guman. 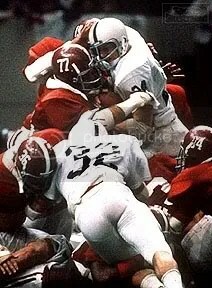 Unfortunately when Guman jumped the pile he was met by Alabama linebacker Barry Krauss and didn’t make it in. Penn State needed to score a touchdown and only having to go such a short distance and not making it is one of those gut wrenching plays. As the story goes, Krauss hit Guman so hard the rivets in his helmet came loose. In 2002, ESPN ranked the 1979 Sugar Bowl as the Greatest Bowl Game Ever, and ESPN.com ranked the final play of that game as #6 on their list of 100 Moments That Define College Football. Mike Guman is an excellent speaker. He talked about life on and off the field. He also provided us with his perspective on all the recent events that have taken place at Penn State. Guman held back tears when talking about Paterno, and wishes the whole situation would have been dealt with better. He got to sit down and talk to Paterno for about 30 minutes after these events unfolded. Guman doesn’t like how Paterno has been vilified. He wishes they would have let him retire at the end of the season. Paterno said to him this was going to be his last year anyway. Right now Mike Guman is Vice-President of Oppenheimer Funds. 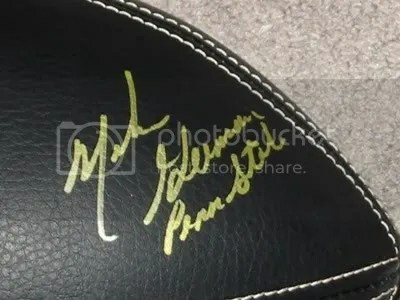 I took my black and gold Penn State football with me and got him to sign it once the lunch was over. Usually I get my photo with the athlete whenever I get an autograph, but this was not an official autograph signing, so I didn’t take the camera. As far as cards go, he doesn’t have that many. Eleven to be exact. His rookie can be found in 1981 Topps card #322. I bet there would be a lot of college football collectors interested in seeing some modern day cards made of Guman. Perhaps a Guman/Krauss autograph? For lunch I had meat loaf, mashed-potatoes, corn, and a roll.